Aren't there certain things you won't leave the house without? Well, I have one more thing for you to bring. 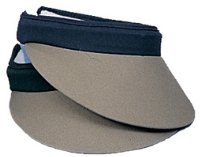 Don't leave home without this cotton twill, slip on visor with inside terry band. You never know when you could use it. Minimum order 144 pcs per color.